Spain is a large country in south western Europe. It shares borders with France, Portugal, Andorra and Gibraltar (governed by the United Kingdom). The capital city is Madrid. Other big cities are Barcelona, Sevilla and Valencia. Spain is part of the European Union and uses the Euro as its currency. Between 1936 and 1939 the Spanish Civil War happened. Spaniards fought a bloody civil between the Republican party and the Nationalist party led by Franco. The nationalists where supported by Nazi Germany (Hitler) and Fascist Italy (Mussolini), with men and weapons as well by Portugal (Salazar) in a smaller scale and some militias from Ireland and Romanian, the Republican party had no declared support by any nation, in fact France and the United Kingdom adopted a policy of non-intervention (France did for a time support the Republicans), the only real support came from the USSR and it included planes and other heavy armament, most of the international help came in the form of militias (mostly civilians without military training) that volunteered to fight Fascism, they came mostly from Communist movements but also others, like Anarchists and Liberal democrats, they came from Mexico, the USA and all around the world, even China. In the end the Nationalist side won the civil war. This was a testbed for WWII. Between 1939 and 1975 Spain was controlled by General Francisco Franco and was run as a dictatorship. Spain has been a member of the European Union since 1986. Since this time there has been significant immigration from South America, the United Kingdom, France, Germany, other parts of Europe and north Africa. Spain is the second largest country in Western Europe (after France). Spain has many high mountains with the largest mountain being Teide at 3,718 metres in the Canary Islands which are located off the African coast. Spain has a mostly Mediterranean climate with warm winters and hot (often very hot) summers. Spain is home to many breeds of animals including the rare Iberian Lynx. Spain is home to over 45 million people which makes it the 6th biggest country in Europe (after Russia, Germany, France, United Kingdom and Italy). The majority of people in the country are ethnic Spanish. There are also large minorities of people from Morocco, Ecuador, the United Kingdom, Romania and France. Spanish (Castilian) is the official and most spoken language in Spain. There are also large numbers of Catalan, Basque and English speakers. The majority of Spanish people are Catholic Christians (76%). There are also large minorities of Muslims (3%) and people of no religion (19%). Spain is a popular tourist destination. 60 million people visit Spain every year with the majority of tourists from the United Kingdom, France, Germany, Sweden and Denmark. The most popular destinations for tourists are the Canary Islands, Madrid, Barcelona, Valencia and the coastal regions of the country. Spain is the 4th most popular country for tourism in the world (after the USA, China and France) and the most popular destination for British and German tourists. 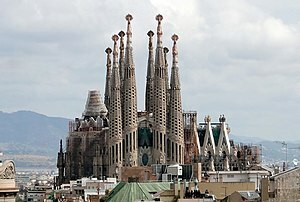 Spain has 42 UNESCO World Heritage Sites, second only to Italy. Notable UNESCO sites include the Works of Antoni Gaudi and Garajonay National Park in the Canary Islands.